Today’s guest post is by Ilan Kelman, from UCL’s Institute for Global Health and Institute for Risk & Disaster Reduction, editor of Arcticness: Power and Voice from the North, and is part of a special series to celebrate UCL Press reaching one million downloads. Are the days over of roaming the dusty library shelves for sombre articles by world-renowned-but-never-seen scientific figures? Now, you can sit over ten kilometres up on an intercontinental flight downloading PDFs. Or seek the face of a prominent name through an image search or watching them lecture online. No more must you queue at conferences to harangue them. On the same flight, or from your phone at home, drop them an email or social media message and skype across time zones. Then, login to google docs from different hemispheres to co-author in real-time. Or use track changes and comments to edit with colleagues whom you have never met or spoken to. Academic publishing is changing. New media and new ways of accessing media permeate science. With publishers, we can and should explore what could work or fall flat–while never diminishing world-renowned, cutting-edge, innovative science. UCL Press already pursues personalisable and interactive PDFs. Images have long been part of manuscripts. Electronic publishing permits audio clips, videos, spreadsheets, GIS files, and other formats as embedded or supplementary material. Patents and legislation are publication formats which academics can write and which are effectively peer-reviewed. Fine and performing arts accept non-written forms for academic credit, whether a composition, a performance, a painting, or a sculpture. All disciplines should adopt similar approaches and beyond. Rather than being within, or supplemental to, a publication, different forms and formats could be the peer-reviewed academic publication. A five-minute video of original choreography could express the islandness and urbanity of London or Bangkok as island cities. A dynamic holograph could illustrate decision-making under climate change. A computer programme could provide an online display which automatically collects, processes, and analyses real-time air pollution data. Any such submission would have to be rigorously peer reviewed, as with papers, chapters, and books. The review process might require as much creativity and open-mindedness as the piece under review. Other options require careful thought and implementation. Could material submitted for peer review, and peer-review processes, be crowdsourced with anyone contributing, as with wikis? Determining authorship could be challenging, but perhaps no more so than a paper for which the list of 5,154 authors is longer than the manuscript. With a New Zealand river being granted some legal rights similar to human beings, could environmental features or processes be scientific co-authors? Isaac Asimov’s fiction writings set the stage for robots and other machines to be considered as peer-reviewed outputs and/or authors on them. Nothing here mean eschewing the lengthy, erudite article or book with humdrum section headings. Nothing here means dismantling libraries or recycling the paper-based journals. It simply means different approaches, forms, and formats complementing and supplementing, not displacing, long-accepted scientific publication outputs. We must continue standard approaches. We must also embrace and create futures of academic publishing without compromising scientific quality. We can be creative, innovative, modern, and engaging without losing the positive aspects of what we have. All futures bring forward needed elements of the past. 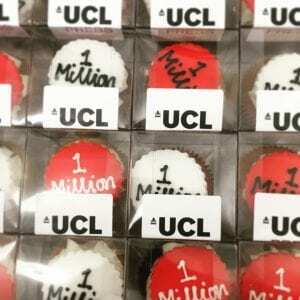 On Monday evening, the UCL Press team were delighted to celebrate reaching one million downloads of its open access books and journals with authors, academics, senior university members and other honoured guests. The event took place in UCL’s beautiful North Cloisters. Since the press was re-established as a fully open access press in 2015, its list has grown to 80 books and 8 journals in a variety of subject areas, and its publications have been widely praised, with reviews in The Telegraph, The Australian, Times Higher Education and many others. 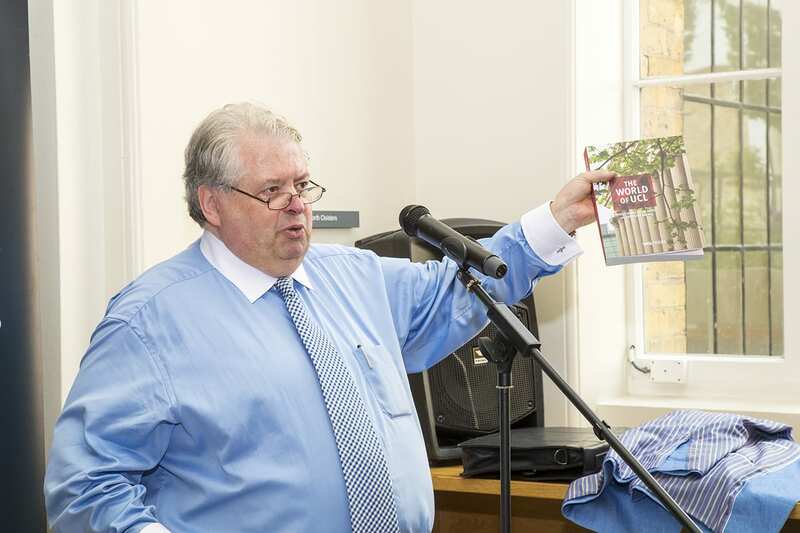 Professor David Price, Vice-Provost (Research) congratulated the Press on achieving its remarkable impact figures and pointed out that UCL Press titles were now downloaded in 222 countries and territories across the world. Notable downloads include those from North Korea, where UCL Press titles have been downloaded 15 times. how astounded he was by the download figures. One of the key questions when the Press was set up was what success might look like, said Dr Ayris, adding that, initially, he would have been pleased with ten thousand downloads in the first couple of years, but, this month, the Press achieved its millionth download. Dr Ayris also shared his passionate belief that the model that UCL Press pioneered can be emulated across Europe. The party also marked the launch of the fourth edition of a landmark book about the history of UCL: The World of UCL. The author of the book, Georgina Brewis explained that extensive work went into creating the new edition, which replaces one published in 2004. A new chapter has been added, and the number of images were reduced, and much work went into ensuring that UCL’s commitment to equality and diversity are reflected in the earlier materials in the book. We were delighted to be able to celebrate with so many those who have contributed to the success of the press so far, and look forward to the next million downloads! Could you be our new admin assistant? We’re looking for a new admin assistant to help support the UCL Press team! Could it be you? This is a rare opportunity to join a fantastic team who are incredibly knowledgeable, experienced and friendly, who have already made a splash in the academic publishing world. Reporting to the Publishing Manager, the postholder will mainly be responsible for assisting with the Press’s marketing and distribution activities as well as other general administrative duties to support the UCL Press team on a part-time basis. The postholder will play a key role in the team, supporting the Publishing Manager, Managing Editor, Commissioning Editor, Marketing and Distribution Manager and Journals Manager in a wide variety of tasks. The ideal candidate will be someone with some marketing and publicity experience, preferably in book publishing, with strong Excel and Powerpoint skills, social media and website experience, with excellent interpersonal skills who is highly organised and methodical. The role holder will also be expected to undertake other related tasks such as updating the website, writing and commissioning blog posts, writing AIs, and other associated sales and marketing activities. This is a wonderful opportunity to play a key role in the early phases of a dynamic new university press at one of the most prestigious universities in the world. Applications close at 23:59GMT on 13 February 2018. For more information, to see a job description, or to apply, click here. Launching at The University Press Redux Conference hosted by UCL Press and ALPSP in February 2018, the University Press Redux Award will recognise an individual, team or university press that has made an outstanding contribution to university press publishing through innovation, providing inspiration and visibility for the sector as a whole, or challenging university presses to rethink or evolve their practice. Nominations should state the individual/team/press name, an explanation in no more than 100 words of why they deserve the Award, and the name and contact details of the nominator (who will remain anonymous unless they choose otherwise). Nominators are encouraged to consider all aspects of university press publishing and to consider colleagues at all career stages. A shortlist of four will be formed from those most frequently nominated, and conference delegates will be invited to vote by email to select the inaugural recipient. In this way the Award will democratically reflect the views of the university press community. The award will be announced at the close of day one on Tuesday 13 February at the University Press Redux Conference. Please do not nominate or vote for your own press as this will invalidate your entry. UCL’s Grand Challenges team have produced a short film detailing the work done by Dr Robert Biel, author of the popular open access book Sustainable Food Systems: The Role of the City, and Senior Lecturer Development Planning Unit in the UCL Bartlett Faculty of the Built Environment. Watch the film below, and download Dr Biel’s book for free here. For me, and I think for many others in the university press sector, the first University Press Redux Conference in March 2016 marked a sea change in the way UK university presses are seen, and see themselves. Kick-started by the momentum generated by the Academic Book of the Futureproject (a two-year research project into the scholarly publishing industry, funded and supported by AHRC and the British Library, 2015-2017), the first University Press Redux Conference in Liverpool in March 2016 was launched by Anthony Cond, Managing Director of Liverpool University Press (winner of both the Bookseller and the IPG Awards for Independent Academic Publisher of the Year in 2015). I use the word ‘launched’ deliberately, since ‘organised’ does not fully convey what Anthony achieved in that first conference. Attended by over 150 delegates from around the world and with speakers from the US, UK and Europe covering all aspects of university press (UP) activities, and with representatives from all levels and functions, the conference offered an opportunity on this side of the Atlantic for university presses to meet, discuss and exchange ideas and information. The mood was buoyant, the presentations were stimulating, and we all learnt a huge amount. Redux 2016 happened at a particular moment, which also helps to explain its success. Scholarly publishing is undergoing significant change, with a challenging market, changes in library supply, digital distribution, new HE policies, and changing university missions which have led to a reexamination of the purpose of university presses. At the same time, many new presses have been springing up, signaling a desire on the part of institutions to do things differently. Redux was an opportunity to share those challenges and changes with all those who work in the sector – not just the UPs, but also the affiliated sectors that we work with: libraries, authors, academics, suppliers, policy makers, funders and our own institutions. And what also came through very clearly was the feeling that we must do this again. And so Redux was born as a regular event on the conference calendar. The University Press Redux 2018 takes place on 13-14 February 2018, at the British Library Conference Centre. It will take place every two years, and it is now ably supported by ALPSP, putting it on a firm footing for the future. Each conference will be hosted in a different location by a different university press which is responsible for organizing the speakers and the programme. I volunteered for Redux 2018 for the main reason that having only launched in 2015, UCL is very new university press with a fully open access model which is still very unusual. As such, UCL Press is keen to collaborate as much as possible with other university presses – to help establish itself, to learn, and to share its experience of its OA model. But also, I volunteered because it’s fun. I think we are incredibly lucky to work in such a collegial sector. There is a genuine eagerness to collaborate and help each other which really stands out. Registration for Redux 2018 bookings is now open and well underway – please join us for two full days of stimulating conversation and presentations. We look forward to seeing you in February! The Frankfurt Book Fair is the oldest and largest book fair in the world. Founded in 1454, it has taken place regularly ever since, and it attracts more than 7,000 exhibitors from over 100 countries and over 278,000 visitors annually (2016 figures). It has five separate halls each with several floors. The Fair has a dual purpose: for most international publishers it is a trade fair where they come to do business every year: to sell international rights, and meet with suppliers and other collaborators and colleagues, and that is what the first three days of the Fair are devoted to. For many of the German publishers, it is very much a Fair to promote their new books to the public, and visitors come at the weekend to see the displays of books and attend author presentations. Each year there is a country of honour, and this year it was France. The Fair was opened by Chancellor Angela Merkel and President Emmanuel Macron, demonstrating the importance of the Fair to international trade and culture. Every day on the German news there are reports from the Fair’s activities, showing the central place it holds i n the country’s calendar. 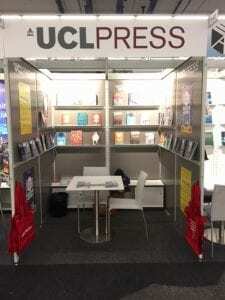 This year was the first year that UCL Press exhibited. We had a small stand in Hall 4.2 where we were surrounded by other UK and European university presses, and other science publishers and small scholarly publishers. I attended for the first three days then Jaimee Biggins, UCL Press’s Managing Editor, came to look after the stand for the weekend and attend a Convention of International University Presses (see here for more). I had over 25 meetings during the three days I was there, and among those I met were other university presses and other institutions with whom we have collaborative projects already happening or in development, such as Chicago and Cornell University Presses; other university presses for sharing of knowledge and information, such as Sydney University Press and Wits University Press; publishing associations with whom we are collaborating such as the Association of American University Presses, the Association of European University Presses and ALPSP; our existing suppliers and distributors such as NBN, OAPEN, JSTOR and Science Open; and potential new suppliers and collaborators. Among the most interesting of this last category was a company called Baobab who distribute both print and ebooks to African university libraries. As an open access publisher with a mission to disseminate scholarly research around the globe, I was particularly keen to hear whether Baobab might be able to help UCL Press distribute its open access books to African university libraries. It turned out that Baobab has an existing service that distributes free ebooks on behalf of NGOs and aid agencies that UCL Press can take part in. Although OA books are made freely available online, ensuring that they reach targeted communities is not always easy since OA supply chains for monographs are not fully developed. So this new partnership is very encouraging and exciting, and it meets one of the key drivers of UCL’s global strategic objective of ‘increasing independent research capability around the world’ by making high-quality scholarly research freely available. All in all it was a very worthwhile event for raising UCL Press’s profile, strengthening our existing relationships, and forging new ones, and we are already planning Frankfurt 2018! The Frankfurt Book Fair is the world’s largest trade fair for books. It takes place in October every year. UCL Press had a stand at the Fair this year where we could showcase our books, and have meetings with other academic publishers and suppliers. While at the Fair, I attended the 5th International Convention of University Presses. The Convention featured about 100 representatives from more than 22 countries and each year it offers an opportunity to discuss new trends in international academic publishing. It is a great way to network with other university presses and those working in academic publishing and gain an international perspective. The topic this year was ‘Translation: Unlocking New Worlds of Ideas’. The day focussed mainly on foreign language authors who want to be translated into English. The keynote ‘What factors determine the circulation of scholarly books in translation?’ by Gisèle Sapiro (Director of Research at the CNRS –The French National Center for Scientific Research) set the scene for the discussion. It sparked quite a debate especially around the funding for translation of scholarly works. Scholarly books are costly to translate and do not sell many copies, so there is quite a dependence on subsidies. Other sources of funding are international organisations and private foundations. Also interesting to note is the trend of scholars choosing to write in English so they will be read right away – this is sometimes at the sacrifice of publishing in their national language. There is also a certain pressure by publishers on academics to publish in English to gain access to the widest readership possible. In the round table discussion there was a presentation of different translation grant programmes, with speakers from organisations in countries such as Canada, Germany, Norway and France all outlining funding programmes that support translation. It was interesting to hear about schemes to support authors by offering grants which cover the cost of translation and also expenses such as book launches and promotional activities. All of the programmes aimed to make academic books more visible through translations. The criteria for this funding varied – for example the Council for the Arts, Canada, base their funding on the impact, merit and feasibility of the project. Unfortunately it is a trend that there are many more applications received than grants available. Astrid Thorn Hillig from the Association of European University Presses said that university presses need to come together collectively to claim the importance of translations and support more translations. The day ended with pitching of a number of projects for translation by various publishers. Each speaker had two minutes to pitch their potential project, offering a synopsis of the book, and the selling points which provide a case for it to be translated. All in all the day was a real eye-opener into the world of translation and was a great way to connect with international colleagues.